Having finally resolved the story of Amy and Rory (for now, at least) in last week's episode, "Closing Time" finds The Doctor companion-less and making his way on a farewell tour, making a social visit to the house of Craig Owens (James Corden), who The Doctor had previously shared a house with in "The Lodger". Despite his determination to just say goodbye (after waking up Craig's baby son, Alfie) and not notice anything, The Doctor can't help but see that the lights keep flickering in an odd way, suggesting that someone is using a great deal of electricity. 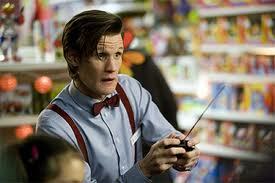 Tracking the source of the usage to a department store, The Doctor gets a job and sets about investigating. But Craig isn't the only old friend in the area, as a group of Cybermen have been using the store as a means of kidnapping people and teleporting them to their ship, where they then transform them into new Cybermen. With Craig and Alfie in tow, The Doctor gets one last hurrah before his final bow, as the date of his death is fast approaching. Despite the obvious opportunities for wacky fun that the episode offered - Corden is as game as he was the first time, and writer Gareth Roberts does a fine job filling the script with zippy one-liners - the thing that struck me most about this episode was the clear sense of melancholy running through it. This came to the fore most prominently at the end of the story, after the Cybermen have been defeated by love (which, despite The Doctor's protestations to the contrary, and his assertion that it was all to do with creating a feedback loop in their emotion suppressors or whatever, is exactly what happened), when The Doctor looks a group of children playing and says that he was always there to help and that they, representing humanity, were welcome, it was probably most compellingly expressed during a scene at the midpoint of the episode when The Doctor was left to look after baby Alfie. Contrasting his own eventful life with Alfie's, which has barely begun, Matt Smith did that wonderful trick of seeming far, far older than he could ever possibly be. Through just his face and voice, he was able to quietly and beautifully convey the essence of an ancient being contemplating their death and reaching a begrudging acceptance. Smith has already done great work in the role of The Doctor over the last few years, but I feel that this may be his finest moment to date thanks to its quiet simplicity. Having said all that, let's not forget that this was a really fun episode. There was an obvious and wonderful joy to the scene in which The Doctor demonstrates a toy helicopter to a group of children, and there a handful of fun setpieces - not least of all a confrontation between The Doctor, Craig and a Cyber-Mouse - building up to the eventual showdown against the Cybermen which were exciting, silly, basically perfect Saturday evening entertainment. Yet what raised the episode up was its willingness to make The Doctor's sadness part of that, without it feeling like an unnecessary piece of saccharine indulgence. It's a fine balancing act, but one that it managed with aplomb. To top it all off, we saw that, as I've been saying for ages, River Song is the Impossible Astronaut who is going to kill The Doctor, and preview for next week, despite looking overly busy and like it's going to try to cram too much into a single episode (Churchill? Again?) also looks fun. Now that the show seems to have thrown off whatever was holding it back, I'm really rooting for it to stick the landing and deliver a finale worthy of the two episodes that preceded it.